Good day fellow comrades~ Im back with a new article to share one of my latest photography works, featuring Sawamura Spencer Eriri in her fap cave… Erm, I mean, her room and workplace – as a doujin artist. This is my first mega project of year 2016 in terms of both the amount of detail and preparations required, and the budget/cost required for it to be made possible. Will there be a second one? I haven’t decided yet myself. Last year in 2015, and the year before – 2014, I only managed one mega project each year due to budget and time constraints. Eriri’s photography project planning actually began back in early February itself – 3 months ago. This article is in reference of the preparation and works in progress for the photography of Eriri. It is a project that took me over 3 months in planning and preparation. Long read ahead, but I’ve split the article into several sections below. The concept behind Eriri’s photo is a bit like a Frau Koujiro 2.0 (PICTURE #1107457) – an otaku in her own room/space but with a change in theme. Frau was more military and mecha oriented (following the theme of Robotic Notes) in a messy room. Meanwhile, Eriri’s setup is more of a tidy and well-organized “home office” with its design and setup reflecting the theme of the series Eriri originated from, as well as the character’s own traits and background itself, where she is a doujin artist whom reluctantly jumped in the bandwagon of bishoujo game-making. The above scenes and pictures depict my source of ideas. I re-watched the anime 2 to 3 times for certain episodes, picking up vital clues in the process. In the anime it is her childhood friend and protagonist Tomoya Aki whom is an otaku, while Eriri herself had a very simple room with retro looking furniture indicating her wealthy family background. However I wanted to reimagine Eriri in her own setting and decided to combine multiple sources of ideas into one. I didn’t want to wait for Alter’s 1/8 Yasuhara Ema figure below (which I’m interested as well) from Shirobako to do a diorama based off a workplace for artists. The additional screen shots far above told me what I may need in my diorama. A laptop, writing instruments, sketchbook (which I substituted with a few sheets of white paper with sketching on it). There are book shelves with manga and light novels in the screen shot as well. So, I need books. And of course, being an otaku also meant figures on desk and shelves too. I need to find very small figurines or gashapon. There are two main reasons why I needed to reimagine her room and workplace. The first to produce an appealing photo due to optimal composition – in terms of furniture arrangement and the color palette. The second is due to me wanting to come up with a radical take on furniture design. I went for a more modern-looking design instead of textbook examples of desks and shelves. Look at the example above, the table looks simple, plain, and boring. I want something unique. So my next step was to look for references online, maybe study a bit of interior design by finding references from the internet and also what kind of dollhouse accessories are available. Besides determining (or choosing) how furniture should look like, I need to arrange them in a proper way. So, back to the drawing board – I placed Eriri on a white frame of 3:2 ratio (the ratio of photos shot by DSLRs), at an optimal position – I could easily tell where is the optimal position even without these compositional grids, but they are there as a guide. And then, I had to decide how Eriri will interact with its environment. What makes a subject look ‘alive’ in a photo or artwork depends on its interaction with the environment (background). From these renders alone, I knew that I cant place the table on the right (behind her), because the table will be cropped off. There are two options – the table behind her (more like beside her, technically speaking), or in front of her (on the left side of the photo). These 2 here are just examples – I’ve had almost 8 different combinations in mind. I made designs based on these 2 possibilities of having the desk either behind her or to the left of the frame. If the table is behind, the shelf will be on the left; and vice versa - if the table is to the left side the shelf will be behind her. It’s important to remember that what’s behind her tends to be out of the camera focus – I had to choose between which one will be in and out of focus – the shelf of figures or her work desk (and the contents on it). Eriri is a doujin artist, so I thought having the table placed on the left side, and in focus would make more sense. But a browse through the internet on modern furniture reminded me that an L-shaped shelf and/or table is also an option – a shelf that is in the background but also stretches to the left side, L-shaped. After determining an L/perpendicular arrangement is a good option, I need to determine what her desk looks like. However, almost every scale model I see on the internet doesn’t fit my criteria. When they do, they are often too expensive, or, I can go the DIY route. However I wanted higher quality and detail furniture where it’s not possible to make based on my current skills, so I ended up having one custom made, and being made of plastic material, it made the price lower than wood sculpted ones. So the above is my finalized render. For the angulation and field of view (the photo will be shot form above eye level/high angle) of this render I used the below image as a reference because I find it very suitable with Eriri’s pose. The render is just a reference; since Eriri is the main subject she needs to occupy a bigger area of the frame, so the final shot would be closer to the cropped portion as highlighted below. I have a preference towards the golden ratio and phi grid for highly complex setups, and rule of thirds for simpler shots. Colors are one of the most important aspects for the appeal of a photo. Combining the wrong colors and you will have an unattractive photo. The same applies to clothes - matching the wrong shirt with trousers or skirts of the wrong color or design and you won’t look good. Of course, there’s always the color wheel concept to guide you. As much as I love to use compositional grids as a guide, I rarely use the color wheel as a guide. It’s a long topic so I won’t elaborate on how I decide the choice colors I use for every different photography project of mine. For the case of Eriri, if you analyzed her color palette, the most vibrant and major ones are her blonde hair (i.e. yellow/gold), and a green jacket, with a very small amount of red, and blue (eyes, bra). Her skirt and shirt (white/grey/dark brown) qualify as dull colors in my books. So, the main color palette here is Green, Yellow, Red, (Light) Blue. I used this very concept in the color distribution of the entire photo – contrasting vivid colors with dull colors. Rim Light Highlighting – Highlighting the outline of a subject/figure with a harsher source of light from the side or behind. Having lots of heavy shadows which is used in dark scenes to create contrast is not an option, and background blurring (bokeh) is also not an option in dioramas, so it all comes down to the third method of separation – color contrast. Rim light Highlights are also unsuitable for a complex setup. So, the plan is to have objects of interests (besides the main subject/figure) stand out due to their vibrant colors, against a dull colored background. In addition to making use of compositional grids, this kind of color combination will prevent the photo from looking too messy, unattractive or distracting. So, objects like the figurines on Eriri’s shelves, Eriri herself, and maybe a few objects on her desk will be colorful, while everything else will be white/black/grey, creating contrast. 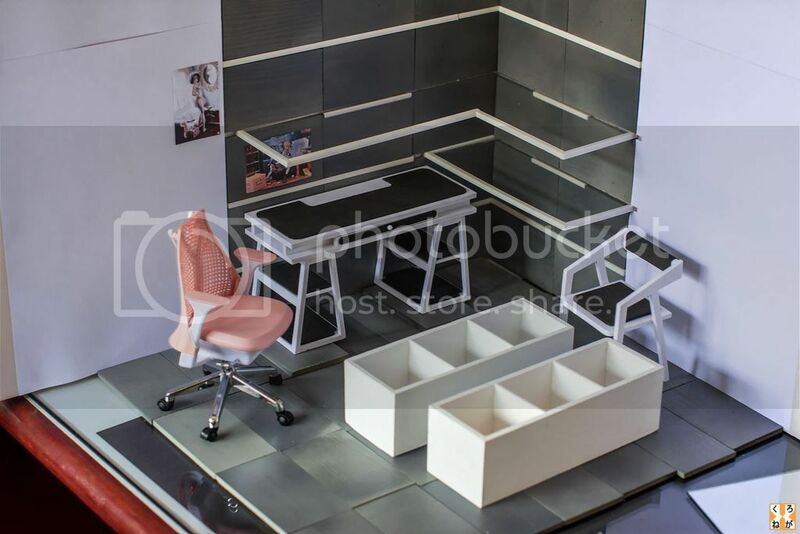 This is why I decided her work desk to be black and white, why the wooden flooring and some areas of the walls should be grey (instead of any shades of brown). When it comes to interior design the wall and floor should contrast in color, but I had to break this rule in order to come up with an attractive photo. Eriri’s office chair is the only furniture in color. I chose pink because of color matching, using the pastel color group as a reference. The major pastel colors are light amber/orange, lime green, baby pink, light pink, but sometimes shades may vary. Pastel colors are often light and faded, but for my case I derived the color matching from the pastel group but more vibrant and saturated. Oh wait, those looks like Microsoft Windows colors too. The Sonico figure below is one example of a figure in pastel color. Well as I mentioned, shades can vary. For this Sonico the shade of green is closer to aqua/miku blue while a light shade of purple has replaced blue. I went all out with my budget for this photography project, not wanting to cut any corners. Most of the props here are either purchased outright, or commissioning someone to custom build or provide the parts that I need. Only the wall and flooring, and the shelf are my own DIY work. Pre-cut blocks of wood (ordered from a supplier with dimensions specified by me) are arranged on a foam backing and spray painted grey. Gaps between the wooden blocks are meant for the shelves to be fitted in. Only areas of the wall where shelves will be placed will have a grey wooden backing. For the gaps between other planks where a shelf will not be inserted, an ABS plastic rod will be inserted to fill up the gap – maintaining the consistency of the design. The shelves are clear acrylic plastic plates being cut into dimensions I specified by a shop that supplies acrylics and glass. The length VS width are in 3:2 ratio, matching the ratio of a photo from a DSLR as well as the ratio of each box of the compositional rule of thirds grid. Geometry consistency also aids in composition. What I did later was lining the margins of the acrylic plates with white ABS strips, the same ones I inserted into the wall’s gaps (To make them look slightly identical to the desk, as if they are one and the same set of furniture – design consistency). The clear acrylic parts are thinner than the white ABS strips, so, in order to prevent the shelves from rocking or shaking when inserted into the wall, L-shaped ABS strips are attached in the middle area of the wooden wall tiles to fill in the gaps created from the discrepancy between the difference of thickness between the frame and the clear portion of the shelf. As for the reason why I prefer the shelves to be transparent, is to allow light to pass through so that there will be less shadows on Eriri’s desk. As a bonus they look like glass shelves. The shelves are inserted into the gap in the wall and appear to be completely free floating – no supporting brackets from the bottom, yet they are capable of supporting quite a substantial amount of weight without collapsing. This desk (and chair which I didn’t use and replaced it with an office chair) set arrived in the mail as specified by me; they are not durable and it is easy to break it, but if I can save some cash (not using better materials) I don’t mind at all, since they are for photography purposes only. Placing Eriri on an office chair despite her sitting position (suited for a bed or floor more) isn’t really an issue, considering Eriri doesn’t really behave like a typical well-mannered girl from a rich family background – the idea is taken directly from a scene in the anime itself. The office chair is made by a company called ZCWO, 1/6 scale, which is designed for Hot Toys and 1/6 scale action figures. I/6 scale writing/drawing instruments, check. iPad - check. Laptop – check. A few drawings Eriri made – check. And, one often needs some refreshments while on the job to maintain being energized. Just paying attention to every single detail I could think of. The laptop has the same exact scene seen in the anime, from the game Eriri is developing with her circle members. There’s a poster of my photo of Frau Koujiro on the wall, because this photo of Eriri is like a follow up of that shot. A reference of some kind. Erm, what about Umaru-chan? Yeah, I added her on the desk together with a 3cm tall Gundam, just for the sake of attraction. Not everyone liked her attitude, but one can’t deny she is one of the cutest hamsters out there. Along with a Gundam, Dragon Ball, etc, I’m targeting multiple fan bases with this one single photo, trying to appeal to as many audiences as possible. The sketches on the desk, apparently done by Eriri as a doujin artist, is a conversion from my own photos. And… of course, manga and (light) novels. And magazines – check. The figures on display on Eriri’s shelves are one of the hardest ‘parts’ of this setup after the planning stage. Most gashapons are too huge (8-10cm tall average), at this height they will look like 1/3 scale figures next to a 1/8 and 1/7 scale figure, assuming the 1/7 scale figure is life size. I combed through eBay, Japanese sites, China’s Taobao, etc searching for 3-6cm tall gashapons that preferably aren’t chibi figures (huge head, small torso). Yes, it’s pretty nuts trying to search for ‘scale figures’ that are only several centimeters tall without looking bad, and worse, I needed at least a couple bishoujo figures. I spent over 2 months on the internet looking for what I want whenever I had free time. I picked up a set of 10 Dragonball figures of only 5cm tall each from eBay, from a Japanese seller. And, in the end I found three bishoujo gashapons that I wanted in Taobao, genuine ones (only two are used in this setup, Eva’s Ayanami Rei and Queens Blade’s Reina). Some of them are rare products and don’t come cheap. Queen’s Blade Reina (5cm+) by Kaiyodo, Bandai’s Ayanami Rei (5cm) that’s not too tall due to her pose and appearance as a bust figure. I was lucky that Phat’s Shiro from No Game No Life was released not long after Eriri’s release, so I borrowed the chibi figures from Shiro too. That saved me some effort from searching for more mini figures. I avoided using cheap materials or cutting costs too much with the setup, and I went for genuine trading figures and gashapon. In the end this entire setup (every single item included, except the 4 chibis from Phat’s Shiro, and Eriri herself) cost me in excess of USD$150 to build. It’s my most expensive setup to date. Lighting-wise, there’s nothing as much to elaborate because Im not aiming for any unique effects (which is needed when shooting gravure-style or skimpy figures) – less technique-sensitive skills are needed for the case of Eriri, but the key light is required to be the most intense one out of multiple light source in order to create an exposure gradient. Mirrors are then used to deflect light (one of them handheld) for shadow reduction. All I needed was throwing in light source from any angle I can think of that will make the whole photo well exposed but there was a problem that was difficult to manage – shadows. Due to the proximity of the objects on the shelf to the wall behind, obvious shadows are inevitable, but I tried my best to reduce them with very soft light sources and reflectors – mirrors. Two mirrors were used, but you can’t see the second one in the photo above because it was hand held from above. Shadows forming behind figures on display on the shelf. However, shadows are also normal in a sense that if one of the corners of the room had sunlight coming in from a window, shadows will definitely appear. Since this photo is a diorama, the presence of shadows are acceptable (but not so much when it comes to portraits), because it is supposed to depict a real life scene. The amount above spent on making this shot possible alone can buy you a scale figure, or up to 3 nendoroids. The quality of my props for every single one of my photography projects are inconsistent due to budget constraints, but for huge projects that comes only once or up to twice a year, I have a tendency to go all-out, no holds barred. I didn’t want my photos to come up short of my own expectations. For the case of Eriri, I wanted high quality props, high level of details, spot-on composition and lighting, all in one single package. As for the second half of this year, I have very few figure preorders. Huge projects like these don’t come by easily because not every figure is photogenic in a way it fits naturally in a diorama (highly dependent on the pose and theme). If I do see the potential it may qualify to be a part of my huge project considerations. There may be a lot to read, but to everyone whom have at least gave this article a quick glance, or even reading it, thank you very much. =) If I come up with anything unique I will share them again. Love every setup you do! Once again, congratulation and continue to have such passion when you tackle a project. Great article, and I was floored when I saw my office chair on there! FYI, it's a replica of a Herman Miller Sayl (I have the white/grey and red). I just went out and bought one of my own 1/6 scale ones. Awesome work, i know i dont have the patience to create a picture like this. This is a masterpiece! I would very much like to learn your ways oh great kamesamma of figure photography! You know when you go shopping at IKEA, try their different room setup, and you are sometime in awww ? That's how I feel looking at this picture. Figure Photography: PlusOne's 1/7 Tohsaka Rin Racing ver.